I have been making my own tortilla bread for a couple years now. The recipe is super simple and quick to make. 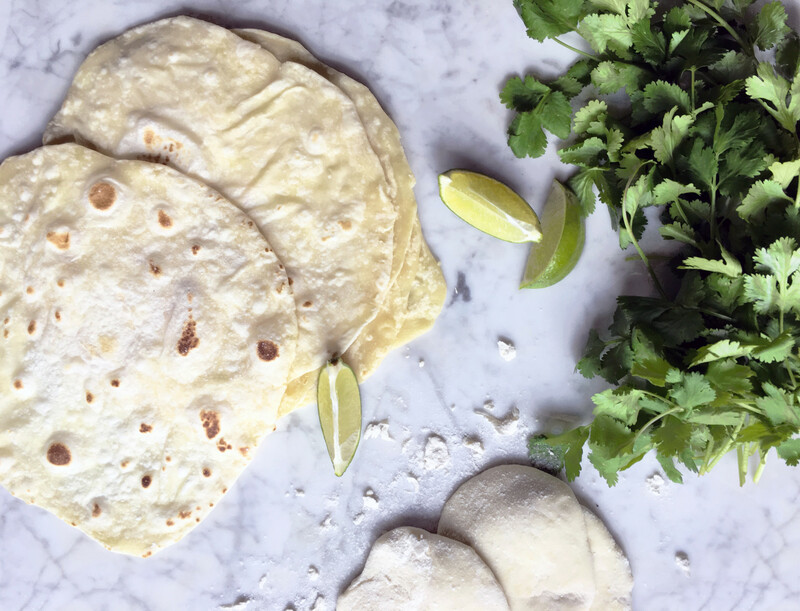 Once you make your own tortilla bread, you will never go back to buying commercial one. It’s a very useful recipe to have on hand, mostly when your refrigerator is empty. The tortilla bread can be used many ways, as a wrap, as a sandwich, as tortilla chips, as pizza crust, the possibilities are infinite! Bon appétit! In a bowl, mix all ingredients until the dough forms a soft ball. Cover the dough with plastic film and let rest for 10 minutes, at room temperature. Divide the dough into 8 small balls. On a floured surface, roll out the dough to obtain a very thin disc. Make sure the sides of the tortilla bread are as thin as the center. Preheat a frying pan and add a little bit of avocado oil. Place the tortilla disc in the pan and cook on each side. The cooking time per tortilla should be less than 1 to 2 minutes. I like to roll out the dough only a couple times and finish them up by stretching the dough into a disc. If you ever make a hole while stretching the dough, you simply press both sides of the hole together, the hole should be repaired. That way you will obtain very artistic and unique tortilla bread. Hi Sacha. I made the tortilla bread (wrap) today and wow! The tortillas cooked up beautifully and taste great. I am so happy I can use them during this hot weather. Thanks for sharing a wonderful recipe.